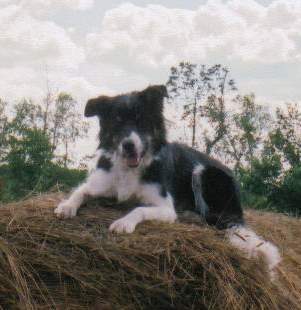 Susane’s philosophy and approach to herding training is basically this: Allow the dog to control the livestock. This is accomplished under as controlled a situation as we can make it. We always start with the dog on a long line and in a small pen (about 45 feet square). Our first priority is protecting the sheep/goats. We always start on sheep or goats because we don’t have cows and ducks are much too frustrating for the dog. If the dog is too intimidated by the situation, we change the set up until the dog is able to relax and understand that it’s okay to show interest in the sheep. 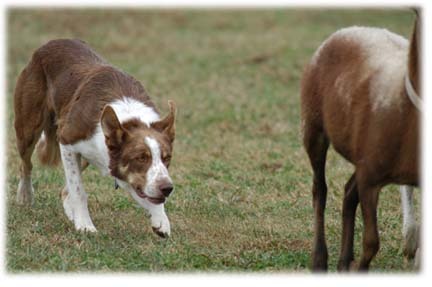 Herding is not a black and white endeavor, it’s a dynamic, ever-changing situation, so one always has to be flexible. Every dog is different, so training techniques and approaches have to be tailored to the individual. If you see a fellow student whose dog appears to be making progress in leaps and bounds, while you and your dog appear to be stuck in one spot, you cannot worry about that. Your dog has to proceed at it’s own – and YOUR own – pace! So, what’s “stock sense” you ask? The short answer is that it’s the ability on your part to KNOW where you and/or the dog has to be in order to make the stock do what you want. Here at our place, our students will have lessons where the dog gets tied to the fence (yes, all good stock dogs need to learn patience!) while YOU move the stock. When you can figure out how and where to be, then you can hopefully see where it is your DOG has to be in order to put the sheep where you want them. How do you get to that point when you can walk out to the gate, give the dog a quiet shush, and he sweeps out wide and deep and “cleans the pasture” while you turn your back and do something else until he shows up with the sheep? With Duce it was easy – I have no clear recollection of ever having to teach him how to do a proper outrun and lift and then bring the sheep at a nice, easy pace. However, I do believe that the ATTITUDE I instilled in him from an early age is what allowed him to become such a useful dog. ATTITUDE can also be called obedience. But it’s more than that. A dog can be obedient without having the correct or proper attitude. In other words, if the dog has to be constantly reminded to walk politely on lead, or to not go through gates without being told to stay multiple times or if he takes off after sheep just because they’re there unless repeatedly told to stay; if he doesn’t come when he’s called until you’ve yelled five times; if he can’t be relaxed if sheep (or ducks, or cows, or goats, or whatever) are present, even if they’re on the other side of a fence, then I’d suggest that he doesn’t have the correct attitutde. So, the correct attitude means that the dog is obedient because he chooses to be and not because you’re constantly reminding him what you told him just 30 seconds ago. In my opinion, a dog with the proper attitude looks at you and “says” – What would you like me to do? But wait, there’s more. A dog with good attitude isn’t a robot. Just because you’ve instilled good attitude doesn’t mean that you’ve taken all independent thought away from him. 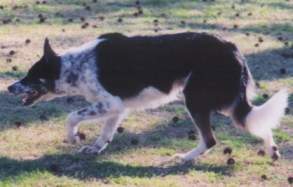 To be a useful stock dog, the dog MUST be allowed to think on his own and to make choices. Remember that first sentence above. A dog with proper attitude is allowed to work out the details on how to get the task accomplished on his own. He doesn’t have to be micro-managed and told what to do every step of the way. BLACK and WHITE. One of the most important things in any training that you do is to keep your instructions to your dog very clear. Dogs don’t relate well to gray, they need things to be black or white. Yes or No, never maybe. One simple example. Don’t go through the gate until I tell you to. “She never does” you say. But wait. Is she staying on the outside of the gate because you are PREVENTING her from going through it? Are you blocking the gate with your body, or holding back ever so slightly on the leash? If you are, your dog will never learn to not run through the gate without being asked because she’s not given the opportunity (yes, you read that correctly) to be wrong. Being wrong is a good thing. It’s by being wrong and experiencing a consequence that your dog will learn to be right. CORRECTION/PUNISHMENT. Yes, you can teach without correction, but I’d be willing to bet that you’re not going to get very far, especially in herding. When you’re dealing with instinct, if you have no “UH-OH” (as in, Dad’s going to be very mad at me for breaking the window) in your dog, what could you possibly do to make your dog stop chasing the sheep when her instinct tells her to keep going? Just something for you to think about. RELATIONSHIP. Yours with your dog and your dog’s with you. A good training partnership is built on trust. Trust is built on mutual respect. You must be a strong leader for your dog to follow. When you are a strong leader, the dog will trust you, because she never has to guess what is expected of her. Dogs are pack animals, and as such, they require a pack leader. If you cannot be that leader, your dog will take over that role and the consequences are normally not good. Lots of dogs end up at the shelter or pound because their owner failed to live up to his or her end of the bargain. Leadership is not achieved by being mean or unfair. And it sure isn’t accomplished by “dominance exercises” that some so called experts proclaim. It goes back to BLACK and WHITE. Have rules, live by them, and always back up your demands. Don’t just threaten punishment – back it up. By the way, punishment can be any thing the dog perceives as unpleasant. We’ve been conditioned to think that punishment is something meted out by physically harming the dog (or child for that matter). It can be something as simple as a crate time out. ENJOY THE JOURNEY. Remember that it’s not necessarily the end result that matters the most, but the journey that took you there.